Students and faculty during Team Time at Urban Dove Team Charter School in Brooklyn. Gone are the days of writing one hundred times on the classroom blackboard, "I will not..." With zero-tolerance discipline policies at school heightening since their introduction in the 1980s, disruptive kids sent down to the principal's office are more often automatically suspended. That student at the back of class might be disobeying the dress code, texting, or using profanity with the teachers—not ideal behaviors but not unquestioningly cause for suspension. Slinking back to class after serving the punishment, the child is often labeled a troublemaker, re-accepted warily, and more prone to future escalating reprimands. More and more, social activists are understanding how we discipline in school sets a tone for the community. Restorative justice is a direct response. First coined in the 1950s as an alternative theoretical model for criminal justice, Howard Zehr's Changing Lenses–A New Focus for Crime and Justice (1990) framed restorative justice as a shift away from a popular view of crime. Rather than being against the state, offences were seen in terms of people and relationships. By the end of the decade, it was applied in a variety of ways. In the criminal justice system, after extensive preparations, crime victims voluntarily meet with offenders to discuss the impacts of the crime, often as a strategy for rehabilitation post-sentencing. In schools, it looks more like restorative practices: community circles developed outside of incidents; harm circles in response to incidents; judicial committees democratically run by students as well as faculty and administration. The focus becomes about inspiring empathy. A basic premise of restorative justice is that there's a relationship to restore. "We're trying to build a really strong community," says Anna Smith, a teacher at Urban Dove, a charter school in Brooklyn. "So that when kids do something to harm it, there's something to fix." It requires a cultural shift in the school environment, where practices are incorporated into all school activities. The onus is on the teachers, who build a classroom society where there's free choice, clear expectations, and a focus on developing personal relationships. "That means not looking at punishing students or using intimidation or power struggles," says Smith. "Because a lot of times, when kids do get into these situations, you can follow the bread crumbs back, and there was a moment that staff may have been able to avoid the issue." It's a responsibility that many teachers find rousing, especially those who feel dismayed by the results of punitive environments. A December 2014 study published in the American Sociological Review found that the academic scores of "good" students decreases with the rate of suspensions handed out to their classmates. The authors of the study theorized that an excessively punitive school culture has a negative effect on all students. Plus, suspensions decrease a student's chance of completing high school, and statistics show that, depending on the circumstances, that can prime kids for incarceration. As schools increasingly hire unarmed police forces deputized to make arrests, a direct feed from the schools to the criminal justice system has developed that hasn't existed before, particularly in urban districts with large minority populations. According to a 2014 US Department of Education Office for Civil Rights study, black students are suspended or expelled at a rate three times greater than white students. It's come to be called the school-to-prison pipeline. And because this punitive system begins in preschool, where black students represent 18 percent of the population but 48 percent of children receiving multiple out-of-school suspensions, many call it the cradle-to-prison pipeline. Rather than isolating and tracking the offender into future negative behaviors, restorative justice allows for redemption. "One of the reasons there's increasing interest in restorative justice and practices in schools is now that they've started looking at their own numbers and realizing the unintended consequences of these zero-tolerance policies, districts around the country have become motivated to develop alternatives," says Mika Dashman, founder of Restorative Justice Initiative, an organization based in New York City dedicated to building networks between restorative justice practitioners and supporters in New York. "We need to disentangle the concept of punishment from accountability. We live in a culture that equates those two things," says Dashman. "We make this assumption that when we put someone away, they're going to reflect on what they did and the harm they caused, but that's not necessarily what's happening at all." "Schools that have implemented restorative justice practices have had remarkable success in improving student overall performance and graduation rates," says chairperson of the Ulster County Human Rights Commission David Clegg, whose private law practice handles social justice issues. Clegg's been working to promote restorative practices within the Kingston City School District through forums and presentations to the Board of Education because he appreciates how restorative discipline promotes responsibility and builds compassion. "Restorative justice importantly works to make the victim whole and treats both parties with respect." Shailly Agnihotri, the founder and executive director of the Restorative Center based in Newburgh, comes to restorative justice with a heavy heart. A prosecutor and public defender for over 20 years, she lost faith in the criminal justice system's exclusionary practices. "We indoctrinate certain people to accept that they'll be spending a night in jail for hopping a train to get to school or being in a park after dark," she says. Agnihotri feels we're all responsible as a society in how we raise future generations. So last November, she sat with 15 students in a Bronx classroom, passing a talking stick. One student opened a copy of Nelson Mandela's The Long Walk to Freedom and randomly read a passage. Some of the teens spoke of their mothers' resiliency. After sharing their thoughts, the kids remarked, "I can't believe how quickly we opened up with each other." The circle wasn't in response to any incident. It was an example of the Newburgh Model of Restorative Justice developed by the Restorative Center, which runs regular community circles in the city of Newburgh. "What we're really doing is developing the muscle of being responsive," explains Agnihotri. "We're taking out of the equation the quick reaction. They fall into another rhythm with their thoughts. It might be thirty minutes before they speak, so that shifts the energy to waiting and processing before responding." That's a pivotal teaching for teens. A wide stripe of the school's colors, orange and navy, are painted down the length of the walls at the Urban Dove Team Charter School in Brooklyn. Large signs with words like Energize, Empower, and One Mic, decorate the hallway. Motivation is key to the school culture, which achieves it through a sports-based youth development model. Aside from two teachers per classroom, each homeroom also has a coach who instructs two hours of gym daily and facilitates group circles that create a team environment. "So if you don't have it at home, and we don't want you to get it from a gang, we give you that feeling of belonging here," says Principal Amit Bahl. 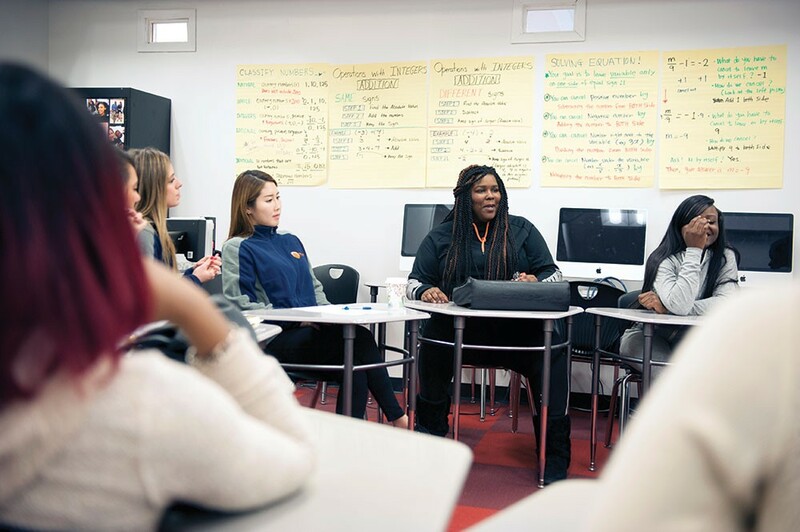 Drawing students from all over the city through relationships with organizations who work with at-risk and court-involved youth, Urban Dove recruits students who struggled in ninth grade. Designed with a longer day, small class size, and trimester system, the program helps students make up missing credits so they can graduate on time. "We're giving them a second option and a restart, right when they show that they're about to go off track," says Bahl. New to Urban Dove this year is restorative justice. Team Time builds team spirit using discussion questions to prompt conversations. They engage harm circles after a minor incident. There's also a Justice Panel class, part of the English Language Arts curriculum, where students perform judicial roles in determining reparations for real-life incidents at school. "One case, a student had an altercation with a science teacher," says 16-year-old Essence. "So we had them build a planetary model together." The staff at Urban Dove feels that even without complete buy-in by the students, just going through the motions of teaching what people need to hear when harm is done is important. "The restorative approach is also about teaching behavior like a skill, the same way we teach math or English," Smith says. Another teacher, Melissa Morales adds, "It's really good for them, as young people transitioning into the really big decisions that they're going to be making." Eighteen-year-old Ricky is hoping to go to Hunter College next fall for engineering. When he transferred into Urban Dove, his school life seriously improved. "Here, if you look like you're down, the teachers will actually ask, 'What's going on?'" That support is key for kids whose behavior can be the result of external stressors or a need for attention. Forty percent of Urban Dove's student population are kids with disabilities. According to that US DOE study, in other school settings, they're more than twice as likely to be targeted for out-of-school suspensions, and more than half of all discipline cases where students are placed in seclusion or involuntary confinement, often using mechanisms designed to restrict movement. School social worker Kelly Schaffer says, "I would assume that every student here has experienced trauma in their lives, and Post-Traumatic Stress Disorder looks a lot like both Attention Deficit Disorder and anger issues." During a judicial panel hearing where a student forged his name on some passes that staff hand out as good behavior incentives, a student jurist asked the teacher who brought the case if she felt betrayed. The student prosecutor explained, "He took her kindness for weakness." The students considered all the emotions at play. In another room, a team of girls reflected on the qualities of a leader and a follower during their circle. "Everyone says something negative about being a follower," one girl mused. "But I think it's good sometimes to be inspired by somebody." The impetus for restorative practices in schools stems from a desire to right a wrong, but it also has the capacity, through its inclusive, democratic approach, to function as a social-emotional teaching tool where kids learn how to heal relationships.